Lavender is by far my very favorite scent. I love it fresh when the plants are in bloom, as it dries around the garden, in sachets tucked into my pillow at night, or as bath salts when I soak away the aches of the gardening day. This magical herb is said to promote relaxation, relieve stress, and even soothe an achy head. Oh, and the bees and butterflies love it too. We can’t forget the pollinators. Harvesting lavender is a great way to tidy up unruly plants and will give you a whole bunch of inspiration for projects throughout the year. There is a proper way and ideal time to cut lavender flowers that is best for both the dried flowers and the plants. 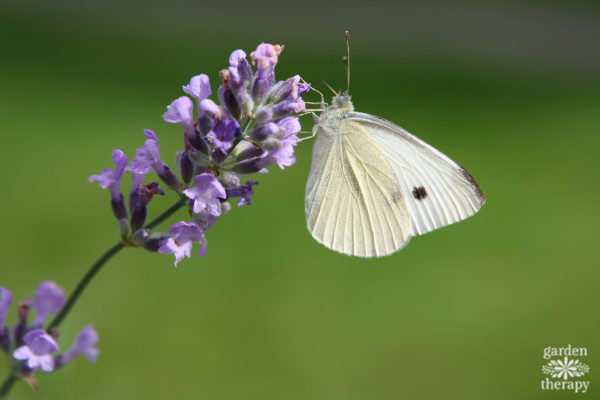 Lavender is commonly grouped into English lavender (Lavandula angustifolia) with its delicate flowers and long stems that soar above the woody evergreen plant, and Spanish lavender (Lavandula stoechas) with its showy hat of bracts on a perennial shrub. I grow a few ornamental Spanish lavender plants, but for year-round crafting and culinary use, it’s English lavender all the way. The best time to harvest English lavender is when the buds have formed on the plant but the flowers have not yet opened. Lavender flowers harvested at this time of year will fall off the stems more easily when dry, making it easier to collect. Closed buds will also retain fragrance and color longer. 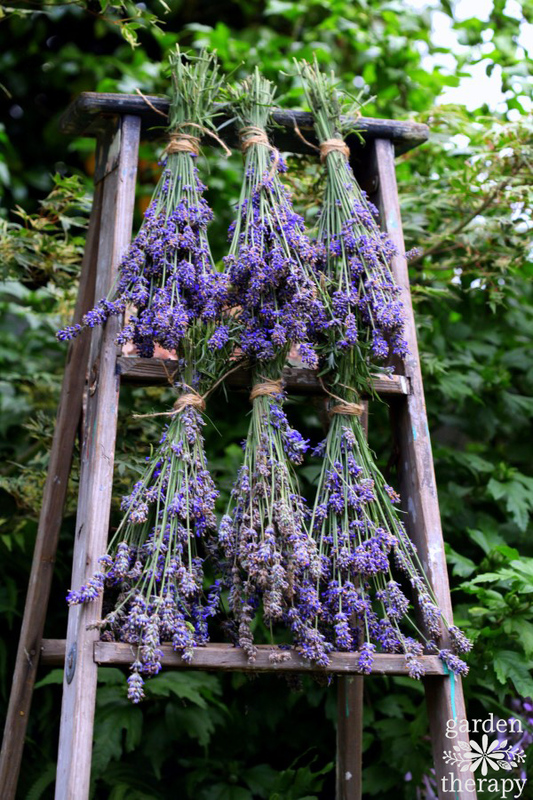 The cultivar of your lavender will also determine fragrance, color, and longevity of the dried stems as well. Hidcote and Munstead English lavender varieties are noted by many to be the best for drying (L. angustifolia ‘Hidcote’ and L. angustifolia ‘Munstead’). To harvest lavender, use sharp bypass pruners and gather a small handful of long flower stems. Be sure that you are leaving behind at least two sets of leaves on the green part of the stem. If you cut all the way back to the woody part of the stem, that stem will not regrow. I like to be generous and leave at least 3-4 sets of leaves on the plant, then go back and prune it to two sets of leaves on the green stem. This ensures that I’m not damaging the plant that gives me all these beautiful flowers! Continue collecting stems in your hand until you have a nice sized bundle. Secure the bundle with twine and continue until the plant is fully harvested. Pruning the plants like this will keep the shrub tidy and evergreen through some colder climates. If your plants are leggy and you see lots of dead wood, it’s a good idea to summer prune them each year until they regain a tidier shape. 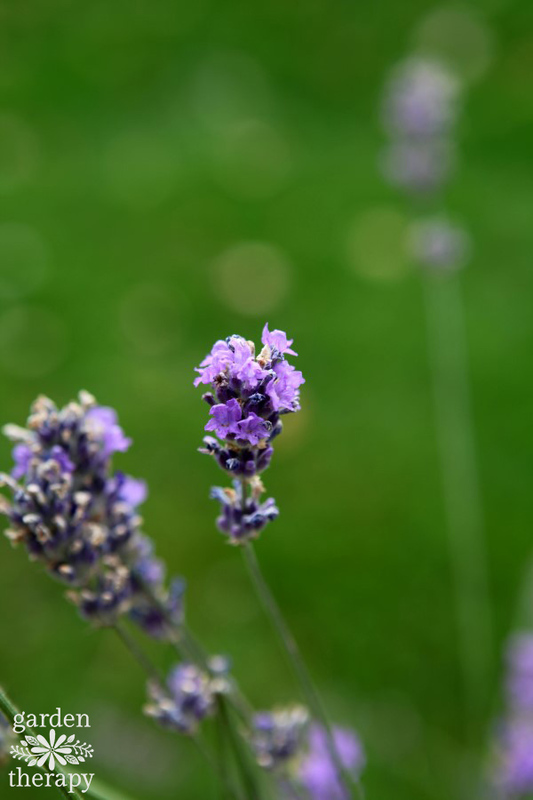 You can safely prune lavender plants twice in the growing season to help define and maintain their shape. 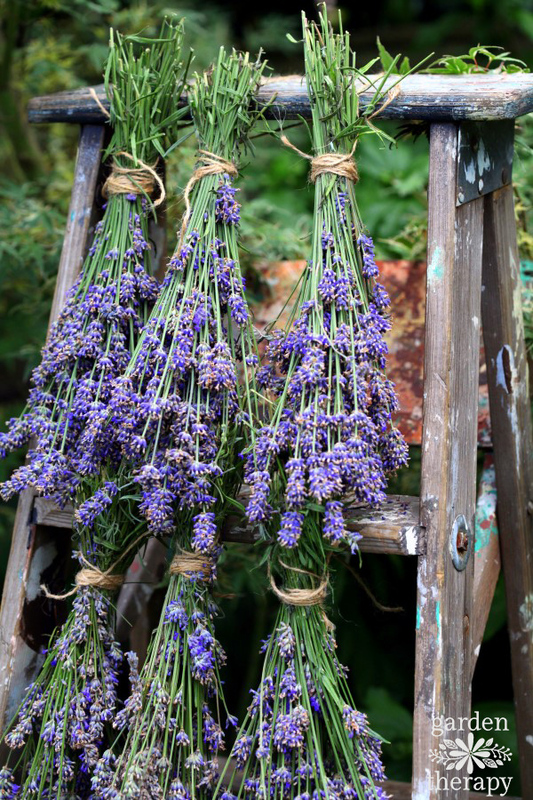 Dry lavender bunches by hanging them in a warm, dry spot, out of direct sunlight. Under eaves, in the garage, or somewhere in the garden that is protected is ideal. My herb dryer is an old painting ladder outfitted with some hooks for the twine. But I have also dried lavender along a shady fence and made it into a dried lavender wreath. 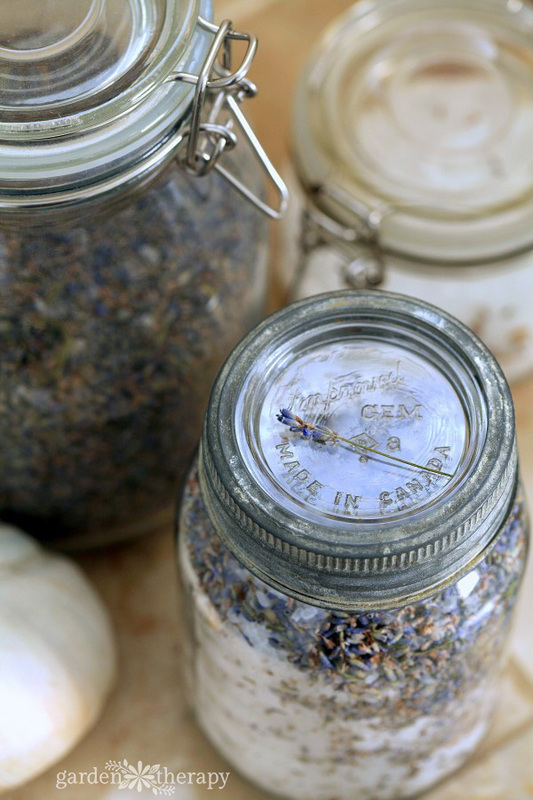 Adding some drying lavender around your home will make it smell heavenly. I highly recommend it. 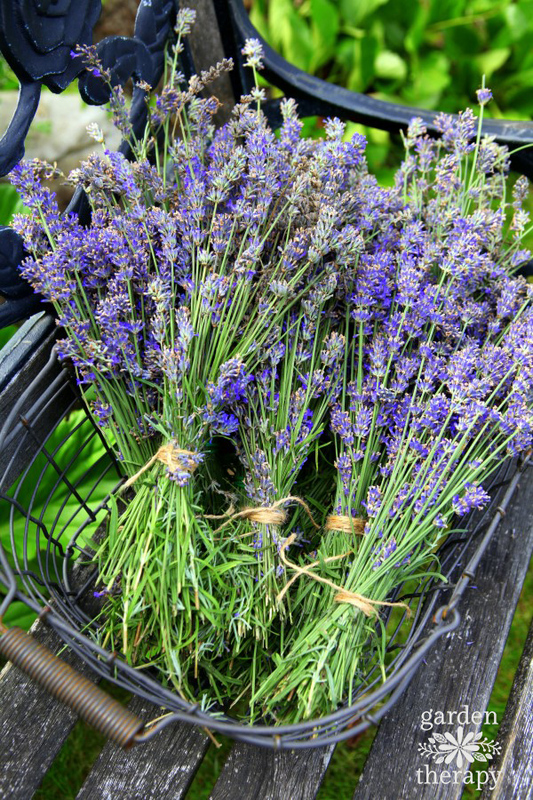 After 2-4 weeks when the lavender has fully dried, you can shake or gently rub the lavender buds into a tray or bowl. 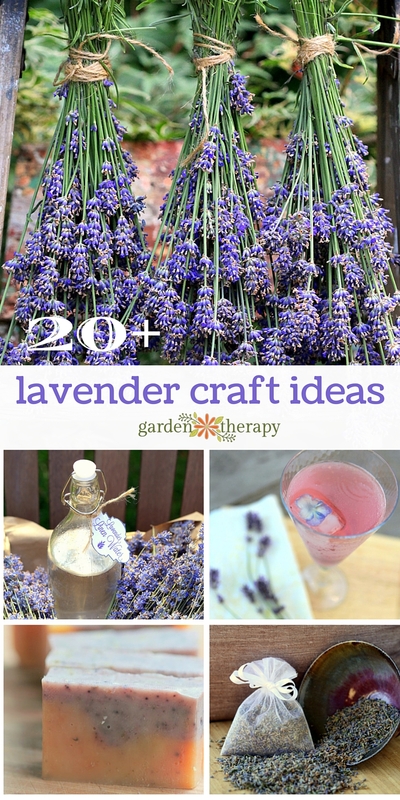 Store lavender in a lidded jar in a cool dark place and repeat next year. In case you are wondering what to do with your bounty of fresh herbs, check out these DIY projects and recipes featuring this star of the garden. If This Doesn’t Help You Sleep I Don’t Know What Will! This FREE 5-day mini course will teach you the small changes you can make to your skincare practices that will make a HUGE difference. We hate spam. And parabens. We won't send you either. I put one plant in about 8 years ago and it’s a big beautiful purple puff ball that takes up a 4 ft by 6 ft area now. This was an excellent article. My question is since I live in zone 3 (northern Alberta Canada) with winter temps dropping to -30C I have had no luck with perennial lavendar plants. I just bought 2 gorgeous specimens that are stoecha variety and was considering planting them in containers. Do you know the best way to winter these over indoors? Would I be best to I treat them as houseplants or place in a dark cool room in the fall? Hi, I was wondering how to dry lavender in bunches so it doesn’t lose it’s colour and doesn’t shed the flowers. The best thing you can do with lavender flowers after drying is to crush them and rub them into baby’s hair. Hi, I’m Stephanie Rose. My love of plants healed me from a debilitating illness and so I know the power of garden therapy first hand. Click here to read more about me and the story behind Garden Therapy. Garden Therapy is a participant in the Amazon Services LLC Associates Program, an affiliate advertising program designed to provide a means for us to earn fees by linking to Amazon.com and affiliated sites. Learn More. © Garden Therapy, 2009-2019. All Rights Reserved. Better Living Through Plants. Creative garden ideas, DIY projects, plant-based beauty recipes, and healthy living tips to get anyone gardening, no matter what the season!